Randall Kirk Myers was born September 19th 1962 in Vancouver Washington. The tall six foot one left hander was drafted after high school by the New York Mets as a first round pick (9th overall) in 1982. 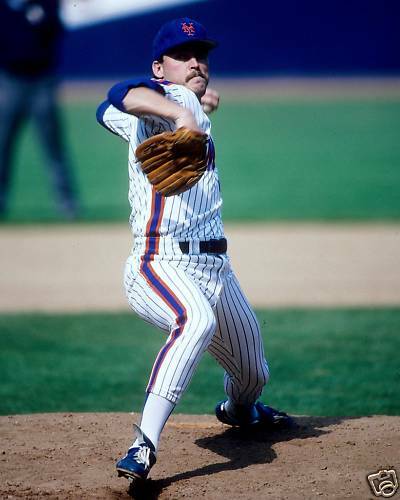 By 1988 Myers would become the Mets main closer saving 26 games (7th most in the NL) to Roger McDowell’s 16 saves. In April he saved four games, and had a better May with four more saves plus two wins, lowering his ERA to 1.10. By the All Star break he was 5-0 & had 13 saves with a 1.35 ERA. He rolled along during the pennant race with nine saves from August 23rd to the end of the season, gathering up 19 strike outs in 16 innings, earning two more wins. He closed out the Mets NL Eastern championship year at 7-3 with a 1.72 ERA, 26 saves & 69 strike outs in 68 innings over 55 appearances. Post Season: In the NLCS against the Los Angeles Dodgers he was the winning pitcher in Game #1 in Los Angeles, as the Mets scored three times in the ninth inning on doubles by Daryl Strawberry & Gary Carter. In Game #3 at Shea Myers got another win, as the Mets scored five times in the 8th inning. He went 2-0 overall in the series without any strike outs in 4.2 innings of work. 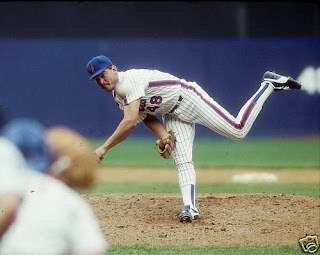 In 1989 Myers began the year with a save & a blown save resulting in a loss on April 11th at Pittsburgh. From there he would win five straight decisions & have eight saves by mid June. On June 21st he saved his ninth game, then over the next two months he would save 12 more games while only blowing one save, maintaining a 1.67 ERA. His September faded away just like the Mets season, as he earned just two saves. The Mets finished second that year to the Chicago Cubs. 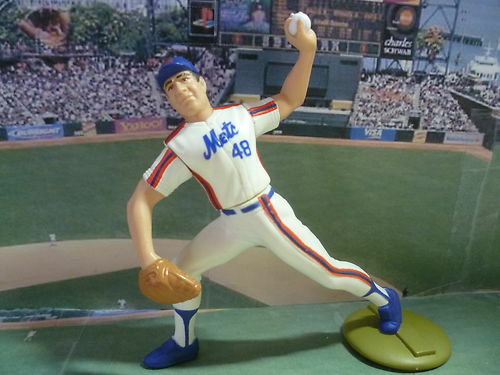 That December he was traded to the Cincinnati Reds so the Mets could get native New Yorker John Franco to be the teams closer. In 1990 he joined Reds relievers; Rob Dibble & Norm Charlton to form the “Nasty Boys trio” who were instrumental in the Reds surprising World Championship. Myers saved 31 games (second to Franco in the NL) going 4-6 with 98 strike outs in86 innings, finishing 59 games in 66 appearances. He came in fifth in the Cy Young voting & 17th in the MVP voting. 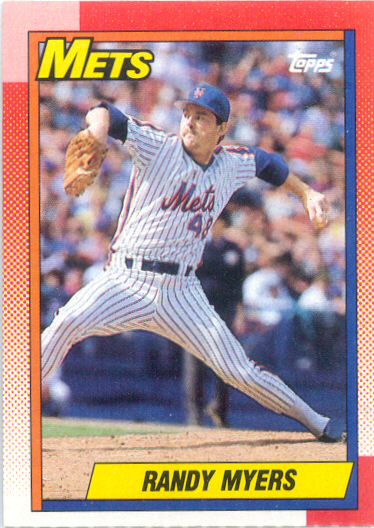 Dibble saved 11 with 17 holds & a 1.74 ERA. Both relievers made the All Star team. Charlton was the other set up man with two saves. Post Season: In the NLCS over the Pittsburgh Pirates, Myers saved three games, with seven strike outs in 5.2 innings. He & Dibble shared co-MVP honors. In the World Series Lou Pinella’s Reds shocked everyone with a series sweep over the mighty Oakland Athletics. In the Series the Nasty Boys pitched eight & two thirds scoreless innings allowing six hits overall. Dibble was the winning pitcher in Game #2. Myers earned the save in the final Game #4 in relief of Jose Rijo in the 2-1 win at Oakland. That year he & fellow reds team mates appeared on a Wheaties box. 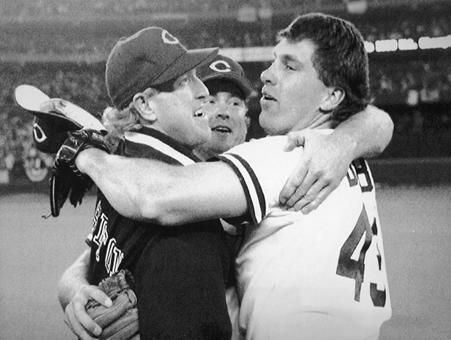 In 1991 Dibble became the Reds main closer (31 saves) as Myers went 6-13 with eight holds & a 3.55 ERA. With Dibble as teams closer, Meyers was traded to the San Diego Padres where he save 38 more games (second in the NL to Lee Smith). 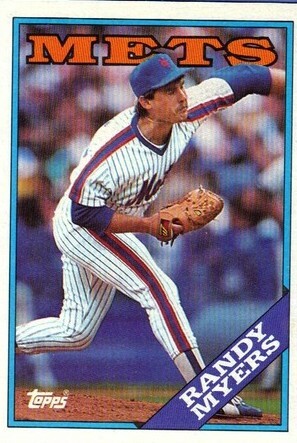 In 1993 he signed a three year deal with the Chicago Cubs replacing Smith as the closer. In those three years he led the league in saves in both 1993 & 1995. He would go to the Baltimore Orioles in 1996 & lead the league in saves in 1997 with (45). He made the post season both years in Baltimore getting all the way to the ALCS with his old manager from the New York Mets Davey Johnson, both years. He was the losing pitcher in Game #1 after serving up a walk off HR to Bernie Williams. The game only went to extra innings because umpire Rich Garcia called a HR on a ball that a fan had clearly interfered with. In 1998 he signed with the Toronto Blue Jays having his last good season, saving 28 more games. Late in the season he was traded to the San Diego Padres to serve as set up man for Trevor Hoffman for the stretch run & the post season. He had a terrible NLCS allowing three runs to the Atlanta Braves in four games for a 13.50 ERA. In the World Series he posted an ERA of 9.00 in three appearances. That season the Padres placed a waiver claim on him because they didn’t want him to go to the Braves, expecting the Blue Jays to claim him. They didn’t & Padres had to pay the remainder of his contract. At the time of his retirement Myers was 7th all time in saves, he is now 9th all time with 347. In 728 games he has 884 strike outs with 396 walks in 884 innings pitched with 548 games finished (26th all time).